We are starting a new edition of BM#67 and for the first week it is going to be No Bake Dessert. I must confess that this theme has been my favourite one, one that challenges oneself to think beyond and create beautiful dishes. Well, let me tell upfront that I haven’t thought much beyond my thinking, and my boundaries won’t go beyond chocolate. I know I know, I have way too many chocolate dishes and the moment I think about my sad Index, I dread and start sweating! I have given up on updating my Index. I am waiting for some magic to happen and I hope it will happen very soon! Anyway coming to the theme I knew I had to make something related to chocolates if I want my boys to eat that as well. I didn’t want to think about Indian Sweets for this theme and Hubby Dear will eat only if it is Indian Sweet. So you know why I had to get struck with just chocolates right! 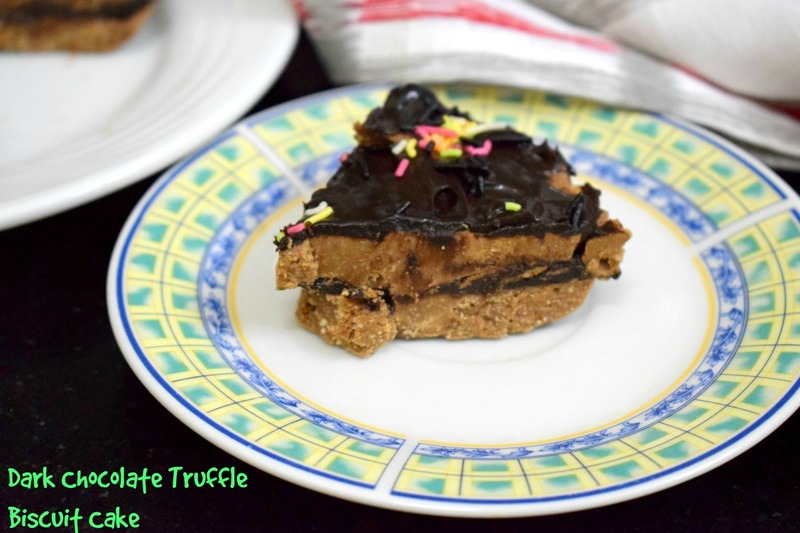 So I was thinking of the various combinations I could make and suddenly remembered all those truffle cakes we keep ordering for birthdays at home in recent times. My cakes do not last more than a day and I can’t be expected to log on decorating a cake. Hence we always order an eggless Chocolate Truffle Cake. Thinking about that truffle concept I thought I should make a Biscuit cake with that idea. I have been thinking about Fridge cake all the time. The entire recipe is something that came about as I was making, so I guess the measurement could be an approximation. However, that works. Break and pulse the digestive biscuits to a fine powder. Transfer to a bowl. Next, chop and pulse the nuts as well. Add to the biscuit powder. 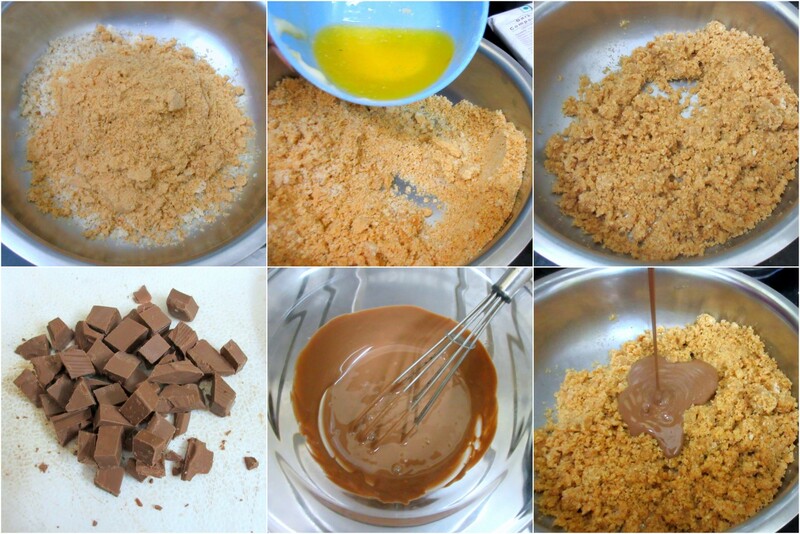 Microwave chopped milk chocolate compound till melted, add it to nut and biscuit powder. Combine everything. Now add melted butter and mix well. The mixture will be slightly running. Grease tray with parchment. Pour half of the mixed batter and refrigerate for 30 mins or freeze for 10 mins. 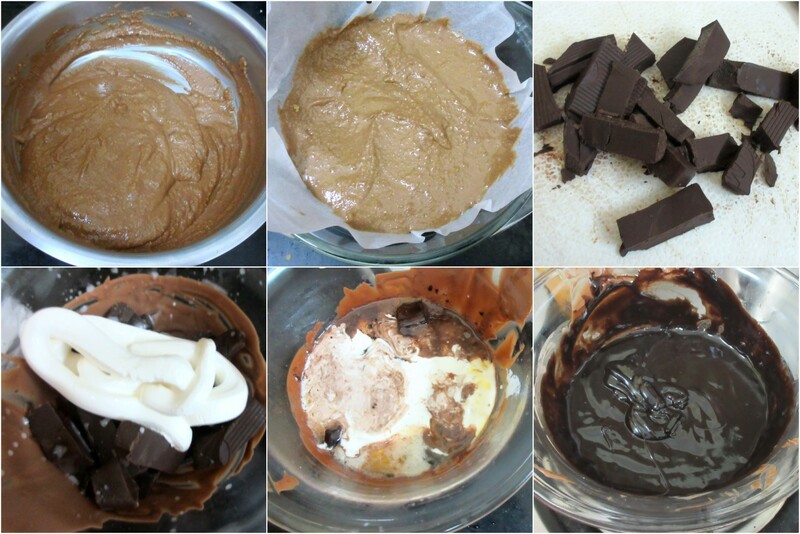 Take the milk chocolate, chopped dark chocolate, cream and MW for a min. Let the cream boil if required. Whisk well till it becomes creamy. Once the base biscuit layer is set, pour half of the ganache over the set biscuit layer. Refrigerate again for 30 mins. 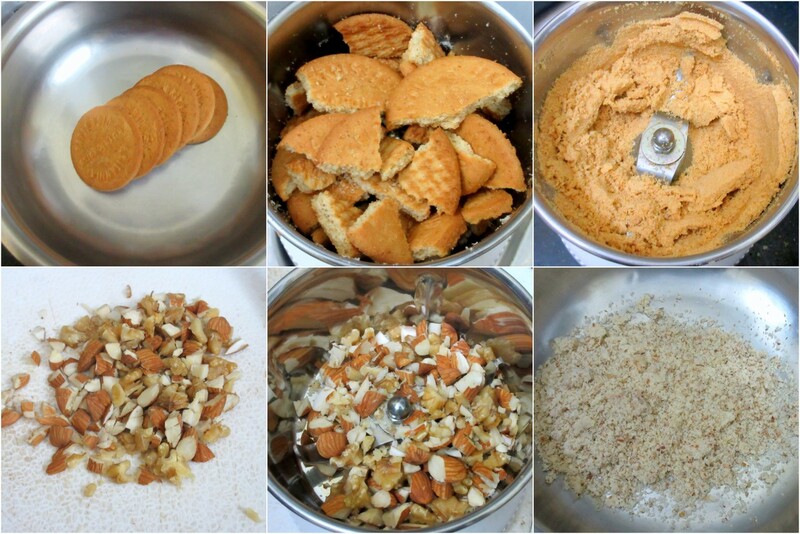 Remove and pour the remaining biscuit mix over it and refrigerate. 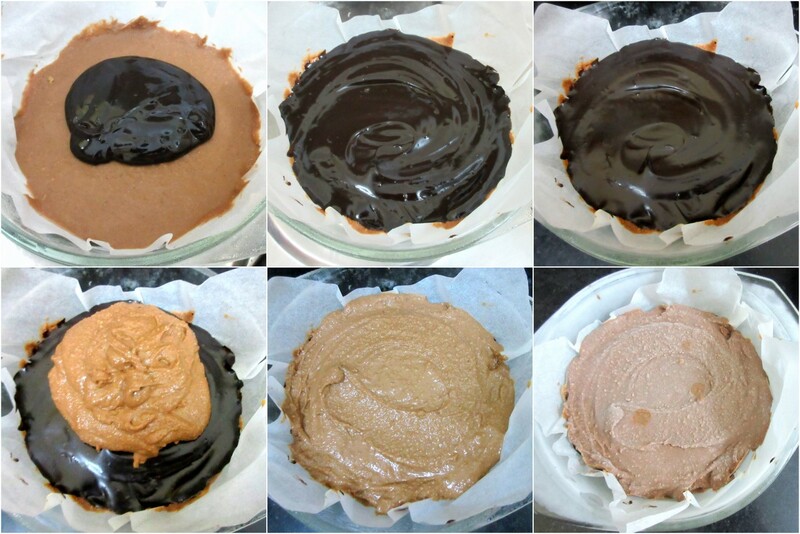 Finally when the whole biscuit layers are set, spread the remaining dark Ganache all over and spread to cover. Decorate with Sparkles and dig in! 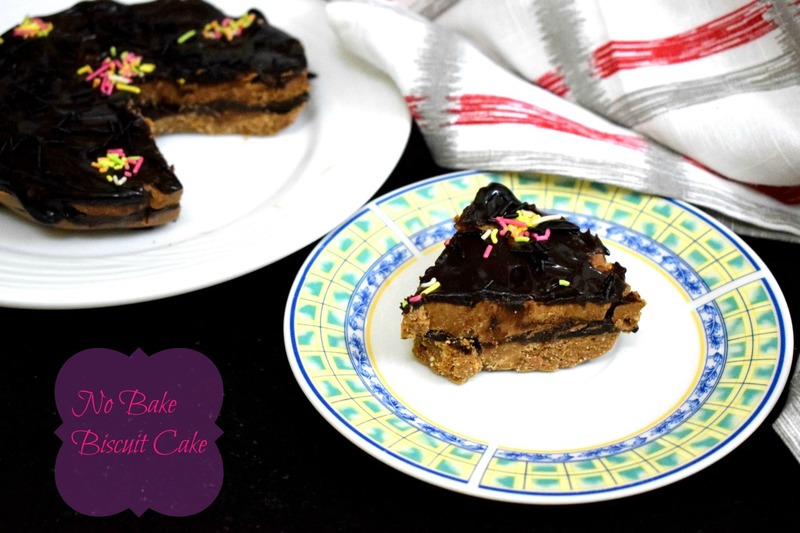 This is best served when it is left on the counter for 10 mins, else it will be very hard to dig in. Excellent celebration cake to dish out when you dont feel like baking. Well done.